At 12,000km, the chain on my Pulsar 200NS had developed an uneven wear across the length of the chain. This set of original Bajaj sprocket and chain was replaced for US$45 in Phnom Penh’s Bajaj dealership when I was touring Cambodia. The set of original Bajaj chain and sprockets set purchased from Bajaj Phnom Penh. Apart from regularly cleaning and lubing the chain, I did not have to adjust the chain slack for the first 9,000km or so. And then I did something really stupid – I hosed the chain with a high pressure washer! A very, very bad decision! Shortly after, the chain started loosening up and I had to do my first chain tension adjustment at around 9,500km. Even then, I started noting a slight uneven wear along the length of the chain. Then, about 1,000km later, I had to adjust the slack again. And this time, the uneven wear was more pronounced. The next adjustment? A mere 800km later. With the chain necessitating such frequent re-adjustments, I knew it was approaching its end of life and it was time for a new chain. I know, I know, best practices calls for the sprockets and chain be replaced as a set. But at 12,000km, the sprockets on the 200NS were still relatively new and visual inspection reveal them to be in a very good condition. “Conventional wisdom” also suggest that unless a chain is used till its very worn, or that you spot obvious sprocket wear, most people can get away with a set of sprockets for every 2 sets of chains. And so, I decided to save some money and re-used my existing sprockets. While researching motorcycle chains, a particular brand was frequently mentioned and stood out – D.I.D from Japan. In particular, their patented X-ring chains. The boxed DID 520 VX2 x-ring chain getting ready to be installed onto my Pulsar 200NS. 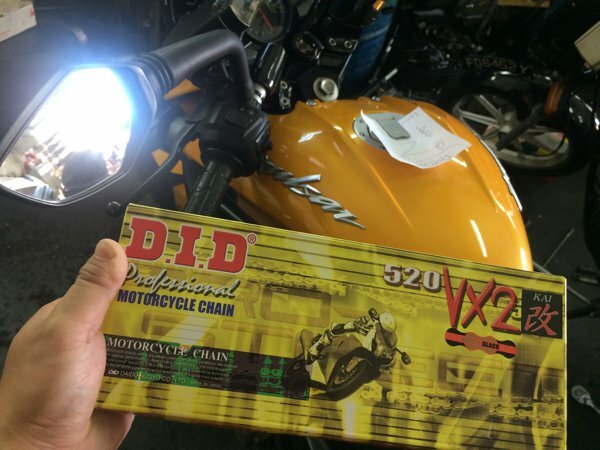 Reviews of the DID chain that I’ve come across online all seem to suggest that DID is amongst the creme-d-la-creme of motorcycle chains. 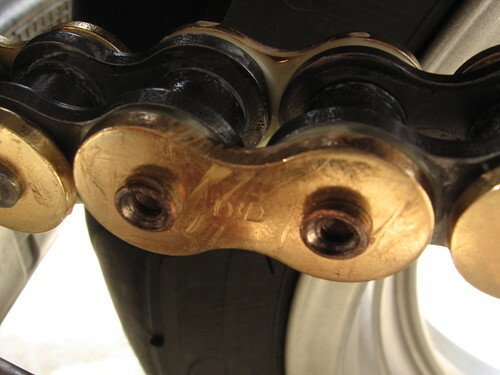 The reasonably priced, patented x-ring construction traps the useful grease within the chain (for prolonged life) while keeping link rotation friction low as compared to ordinary o-ring chains – all these put together in a high quality metal package resulting in high stretch resistance, chain longevity and better mileage through low power loss. DID’s claim to fame – the patented X-Ring. 1.5 to 2 times the wear resistance of normal o-ring chains? I LIKE! Very like! 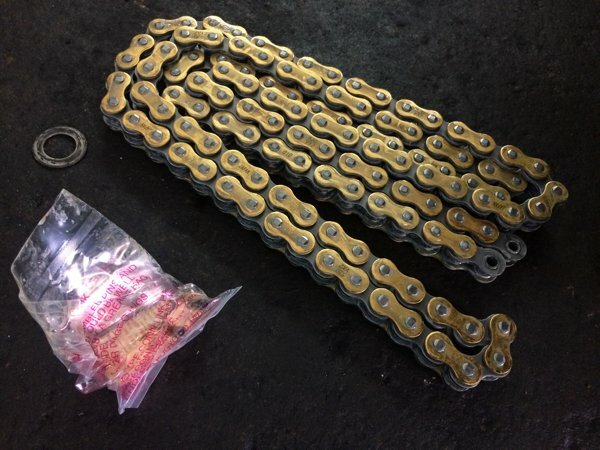 DID claims their 520vx2 chain to have up to 35 times the wear resistance as compared to standard non-o-ring chains. User reviews I’ve come across mostly seem to agree that the DID x-ring chains seem to last longer than standard o-ring chains. In fact, DID claims that their 520vx2 x-ring chain is up to 35 times the wear resistance as compared to standard non-o-ring chains! Okay! Exactly what I was looking for! A quick check with a few places for availability, and I eventually picked up a set from Lim Ah Boy for $85 and another $10 for installation. Inside the package – the golden-coloured DID x-ring chain, a packet of grease and a master link set. 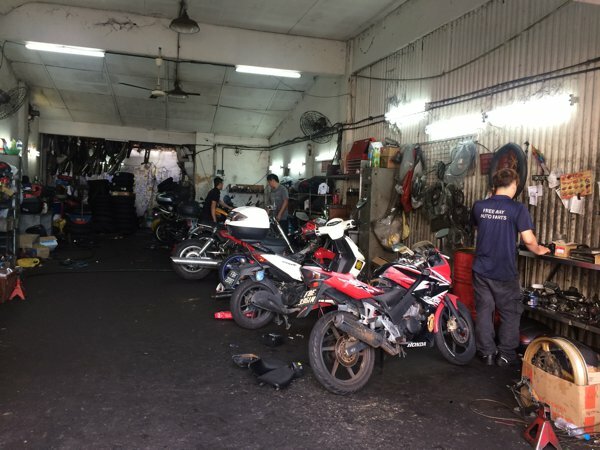 I’ve heard of horrible waiting times (and sometimes horrible service) at LAB’s workshop along Geylang Lor 23, but the workshop crowd seem small today. 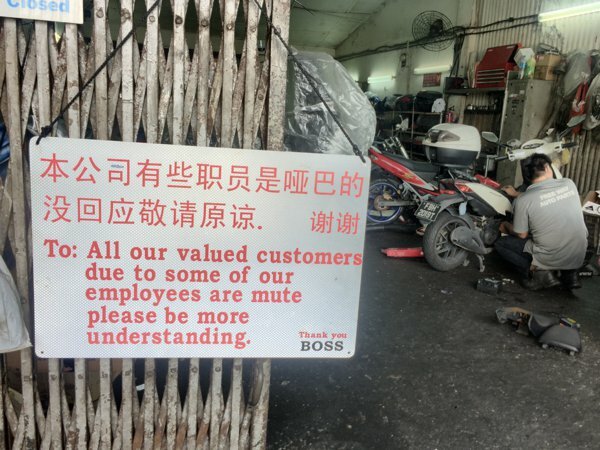 I did not spot any mute mechanic working that day, but I’m pretty impressed with LAB’s inclusive hiring policy! Well done LAB! For a moment there, I thought my Pulsar was installed with a jet engine with afterburners! Nah, he’s just cutting the chain to the correct length with an angle grinder. 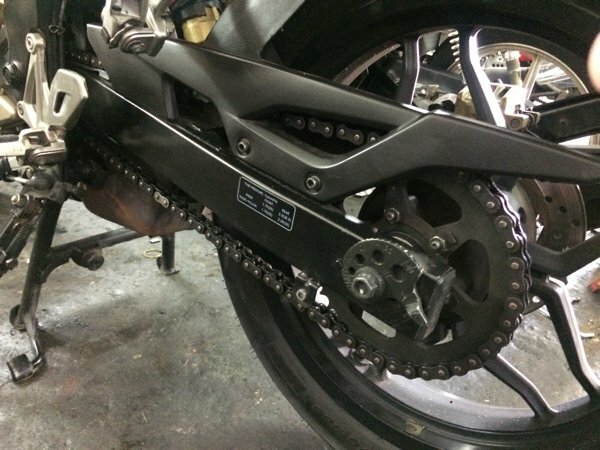 DID 520VX2 X-Ring chain installed onto my Pulsar! Some people seem to like the gold colour – adds bling to the bike. But personally, I couldn’t care for it and would actually prefer it in standard black. But I got this for its performance and longevity at a reasonable price – not for its bling. As I’ve not spent enough time with this new chain, I won’t comment on its performance and longevity yet – I might write a review on this in the future. But my initial impressions on the ride home was…ABSOLUTELY AWESOME! A brand new chain definitely makes the ride smoother and makes the 200NS enjoyable to ride once again! Howdee Bro ‘D’, do you use wet or dry lube on ya chain? Is it advisable to clean the chain (with WD40) prior to oil application? Will WD40 “destroy” the O-rings in the chain? How about engine degreaser? Or good old MaMaLemon to wash all the crap/muck off? I have recently been using silicon spray to clean and lube my mountain bike chain (yeah,bicycle…haha) with no issues…..so far. Was wondering if it would be wise to do same on motorbike? Any comments/opinions would be gladly welcomed. Quite honestly, I haven’t tried enough of different products to comment intelligently on this subject. I’ve only used Motul’s C2 Road Chain Lube on my bike so far, and while it’s lubing well (I don’t even know how to test this?? ), it seem to attract quite a bit of dirt and grime. Hi, just wondering why u pick 520vx2? Why not the 428vx? Have a nice day! 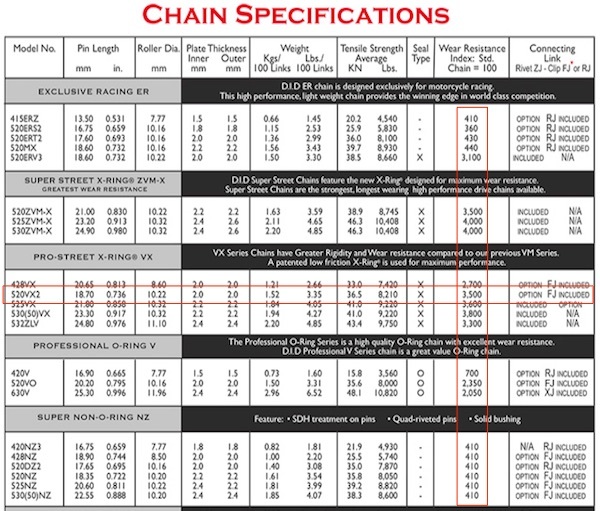 Simple – because the 200NS is spec’ed for a 520 chain. Hi, I am a Pulsar 200NS owner from Vietnam, may I have an update of the current status of the chain, and the riding feeling so far as well? The DID chain is awesome! It’s been almost 10,000km since, and I never had to do any chain slack adjustment. Love it! Thank you for the update. Have an awesome day!!! are those racing chain kits if not can u plz recommend me the site where i can find rscing kit for my wolf…. Those are not. And I have no experience getting them online. Try Revzilla? if you are referring to a chain with no linkage = racing chain , its just a method between mech. as far as I understand the difference between racers chain setup and those street user is that those on the tracks will remove the linkage and making the whole setup fixed. bevel the linkage rod . rivetted method reduce the possibility of the chain link failure and thus your chain is off . thats the only difference as far as i know . I hope this answers your question . Hello sir, i want to ask you can ns200 using 428 chain? Also i want to change the rear sprocket maybe 1-2 teeth down, will it affect the bike?thanks sir. Sorry not so good in english. Why would you want to do that? What are you hoping to achieve? I am looking to purchase this chain for my NS too. I am not sure which length to buy. The wesbites I am looking at are showing DID 520VX2 in three sizes: 112FB, 114FB, 118FB. I assume the numbers are link lengths. Which size did you get? I see that you still had to cut the extra links. Also, did this fit directly on the stock sprockets? Your answer would be helpful. The size of the chain is 520. Don’t worry too much about the length – just cut it to spec. Yes – stock sprockets will work. Will the 118fb sized one , be enough for the ns200?? The Bajaj service manual calls for a 520-series, 108-links chain final drive for the Pulsar 200NS. Hi! It’s pleasure to hear someone like you. First of all Thank you for sharing your experiences with us how about I also bought pulsar 200ns it’s just 8000km only. I got the exact same uneven wear that what you got. I got so many problems with my head. Do i want to change the complete chain sprocket kit or only the chain? And can you please share with us your current experience of your 200ns. And have you ever changed your clutch plate kit? Because when the mileage was 7200km I was changed the clutch plate kit. Is it worth? And do I get any other problem with my 200ns? Thank you for sharing us your experience! How much mileage has your chain and sprocket set done? As a personal guideline, I generally replace the sprocket every other chain replacement – 2 chains per 1 sprocket. Nope – thankfully I never had to replace the clutch plates during my ownership of the 200NS, and have since sold the bike. I no longer ride the Pulsar 200NS. Thank you for replying me “D”. I got the 2017 latest model. My total mileage is 8200km only. I’ve changed my clutch plates on 0-7200km. As i told you I got the same chain problem on 0-8000km. That’s why i confused. Do I want to changed the sprocket set too? . 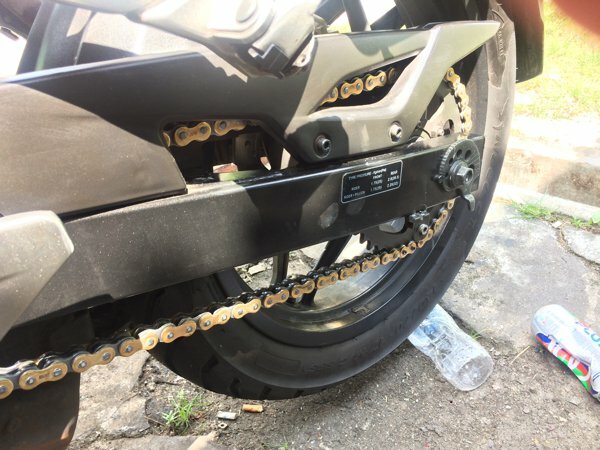 Is that issue comes with the chain or the sprocket? Thank you so much for replying me. Best to get your bike checked by a competent mechanic. I have changed my chain on 22242 kms. I have a NS200. You are right. Shouldn’t spray the chain with water.